We would love to have you join us this Sunday ... and we have reserved a spot just for you! Visitor parking is located on the south side of our building. 9:00 AM* - 1st service (Nursery and toddler care provided, as well as kid's programming for ages 3-12. Check in at the Info Desk and we will help you get your kids settled comfortably. 10:15 AM - Join us for FREE coffee & snacks in the Connection Cafe (on the right side of our lobby). Connect with old friends or make a connection with someone new! 11:00 AM* - 2nd service (Nursery and toddler care available, as well as kid's programming for ages 3-12. Check in at the Info Desk and we will help you get your kids settled comfortably. *Please note that the services offered above are identical. Each service is approximately 1 hour and 15 minutes long. We usually start off with a worship time (with a live band) and we will sing several songs. Guests, the offering is for our regular attenders & members. Please do NOT feel obligated to give when the offering plate is passed around. This will be followed by a short message by one of our other teaching pastors. WHERE IS GRACE AIRDRIE LOCATED? 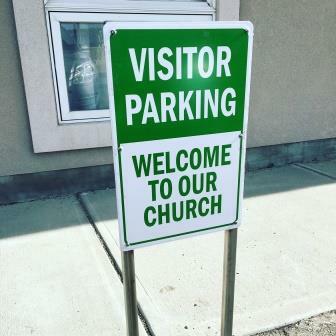 Our church is located on the east side of Hwy #2 in Airdrie right across the street from the Genesis Centre. There is no dress code! Some people are casual and others dress up a little more. It is entirely up to you! We want you to be comfortable. Come just as you are is just fine with us! All volunteers for any of our children programs are required to go through a background check through Plan to Protect and there is a security system in place to protect your precious little ones. This ministry is offered so everyone can participate in the worship service together so feel free to use this service.